One great building in Kampala is Uganda House. Built between 1969 and 1980, it houses the headquarters of the Uganda People’s Congress, the country’s once-dominant political party. 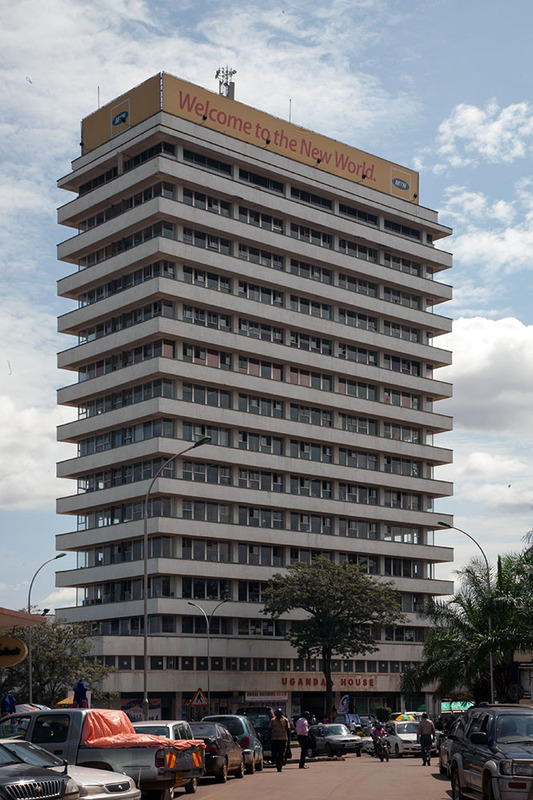 The history of this building is intertwined with Uganda’s turbulent 1970s. Constructions works began during Milton Obote’s first term as president. Idi Amin took over power the year after, leaving Obote in exile in neighbouring Tanzania. Work only finished the year after Amin was ousted in 1979. Uganda House is actually a complex whose most important element is the 15-storey tower, but which also comprises a lower lying yard surrounded by three-storey buildings with apartments and shops in the back. I spoke with German architect Hans Thalgott about the building. He was full of praise for a detail that is not immediately apparent from the outside. The balconies break the monotony of the building’s facade. Upon closer inspection though, one finds that they are not built on the same level as their corresponding floor, but a good part below. For one, this helps cool the building, the balconies above each floor provide shade. This creates a bungalow-like impression in a tall office building: each balcony hangs lowly above each floor and protrudes like a roof. A rippled relief on the balconies’ underside strengthens the association. More importantly perhaps, with windows reaching the floor, this design allows less obstructed views onto the city from the office floors than in other more conventionally designed buildings with balconies. With its importance in today’s political life in Uganda diminished, the UPC has on several occasions attempted to monetise its most prized asset in Kampala. Plans included an intrusive makeover of the building’s facade, visible here. 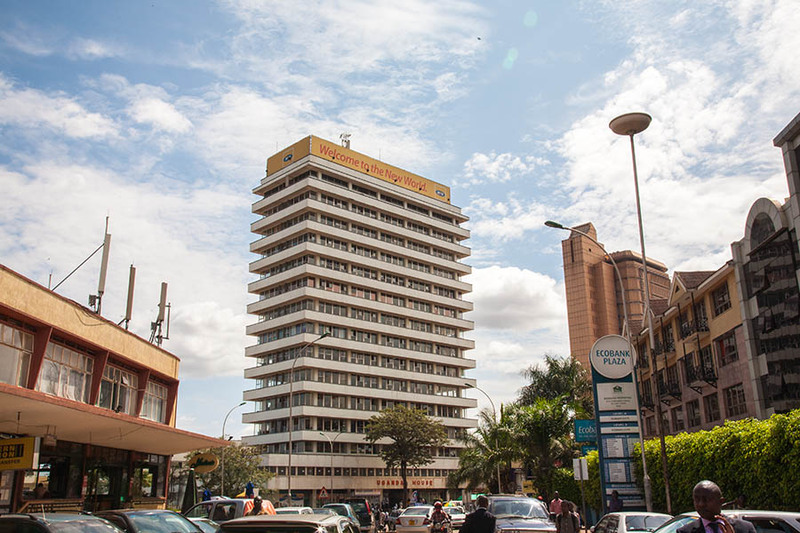 Fortunately perhaps for the integrity of the building’s architecture, a scandal surrounding the building’s owners has hit the news recently and may put on hold further plans to “modernise” Uganda House. This entry was posted in Architecture, Uganda by benbansal. Bookmark the permalink.